BAYUEMAS OVAL KLANG, 10 June 2012 – The National University of Malaysia (UKM) cricket team has wrested the International Invitational Cricket Championship which ended here yesterday from last year’s winner, the University of Colombo, Sri Lanka. The seven day championship saw the UKM team beat University of Colombo by 85 runs after chalking 191 runs against 106 obtained by its rival in the final. This is the second time the UKM team had won since the invitational championship began here five years ago. UKM’s team manager, Dr Tajul Arifin Muhammad was satisfied with the team’s performance following its intensive training to prepare for the championship including playing against the Hong Kong national team which is in the world’s second division. Five other teams that took part in the weeklong invitational championship were University of Liberal Arts, Bangladesh; Christ University, India; National University of Singapore; Siam University, Thailand and Universiti Teknologi MARA (UiTM). It was organised by UKM with the support of the Ministry of Higher Education and the Malaysian Malay Cricket Association. 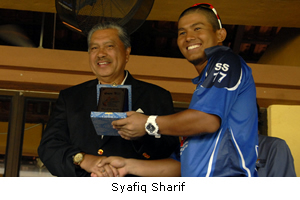 UKM player, Syafiq Sharif was declared best player of the tournament while Mohd. 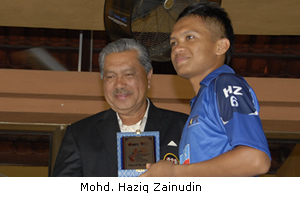 Haziq Zainudin the best player of the final game. The UKM team received a cash prize of US$1500, the challenge trophy and certificate while the University of Colombo received US$1000 and a trophy and certificates. University of Liberal Art, Bangladesh won third placing receiving US$750 a trophy and certificates. Christ University of India came in fourth. Prizes were handed out by UKM Pro Chancellor, Tun Ahmad Sarji bin Abdul Hamid, who is also President of the Malay Cricket Association. UKM Vice Chancellor, Prof Tan Sri Dato’ Wira Dr Sharifah Hapsah Syed Hasan Shahabudin and Dato’ Dr Mahmud Md. Nor; Ministry of Higher Education representative, Kaliapan Rajakumar and Deputy Vice Chancellor (Students and Alumni Affairs), Prof Ir Dr Othman A. Karim who was also Chairman of the Championship were present at the prize presentation ceremony. Dr Tajul Ariffin was grateful to the Ministry of Higher Education for enthrusting the holding of the championship to UKM as the centre of excellence for cricket. The win has given the team further incentive to further improve its standing in the cricket world, he said.